Elusive Onions: Rockabilly Pin-up Mouse? My first impulse was to walk away when I saw this skirt at the thrift shop. The label says it's a size 6, and I am not. Still, I found a few other things I wanted to try on, so I went back and grabbed it on my way to the fitting room. It was the only item I took home that day. 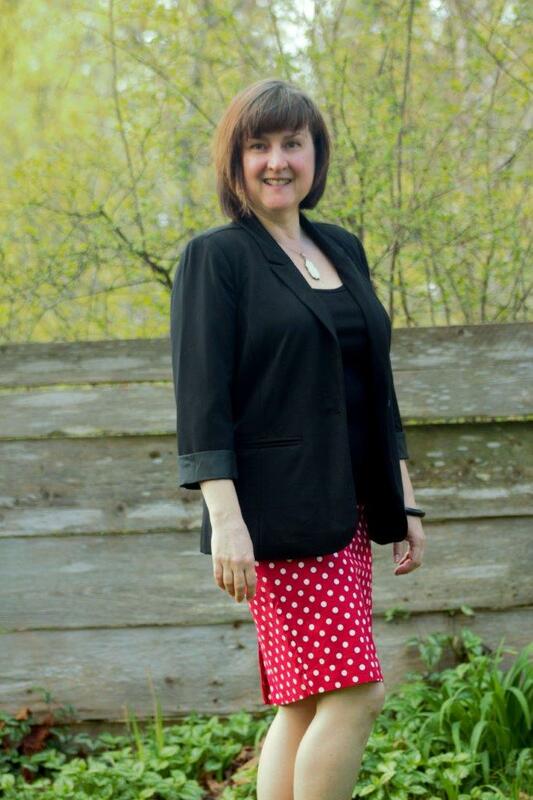 In my excitement at fitting into a size 6, I didn't consider what I would wear with a red-and-white-polka-dot skirt. My closet didn't offer any ideas, so I hit the interwebs. Google brought me images of pin-up-girls and rockabilly style and Minnie Mouse. There is a disturbing number of scantily-clad Minnie Mouse impersonators on the internet. I decided to go with black and white and red all over. My choices must have kept my polka dots professional. I didn't get mistaken for Minnie Mouse once all day. Linking up with Patti and the Stylistas over at Not Dead Yet Style for Visible Monday. Lovely! Nothing mouse-y here at all : > Thanks for sharing your great look with Visible Monday. Thanks Patti. Looks like it's the day for polka dots over at Visible Monday. It's a cute skirt Laurie! Good that you took it with you. You look amazing in it! Thank you Sabine. I'm glad I took it too, though it could lead to more shopping so I have more to go with it. I just love this. No Minnie Mouse here, darling girl. So cool. Really. Have a very good week, Onion Girl. Thanks Jan! The sunnies are prescription, and I didn't have my glasses on there, so you could see my face, but my vision was certainly limited. Oh, that is funny. Scantily clad Minnie Mouse. I love the skirt, and I loved how you styled it. I love polka dots, and red, and white. Yup, I definitely think the skirt is worth 'more shopping'. Can't wait to see how you style it in the summer! So far I haven't even found a suitable red belt to complete the second look. Thrift has been too worn, and the only new one I've found was $80! Thanks Jessi and/or Martha! And welcome! I'm so glad I took a chance on that skirt. You look awesome. No question about that! Black was a great choice to balance out the cheerful fun of your skirt. Thanks Rosiecat! I might go nuts and try blue next.